After trying many different effects pedals and rack units, I've recently been using Eventide stompbox pedals. Click images for Amazon's product page. As mentioned, the Blackhole reverb in the Space stompbox is excellent for my electric violins as well as for guitar and synth patches. 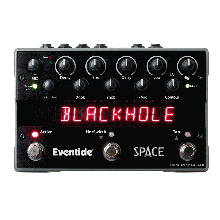 Eventide makes a software version of Blackhole as well, which was a PAR Excellence award nominee. Click into Amazon product pages for details and reviews. For tips and video recommendations, scroll down. Eventide's Alan Chaput demonstrates of all four Eventide pedals in use with factory presets, showing use of MIDI control from the PitchFactor to the other three, slaved tap, and a single expression pedal controlling all four devices (video). The demo shows the stompboxes installed in a floor rig. In the introductory Part 1 of Chaput's 2012 orientation, then-newly added presets and features were surveyed.